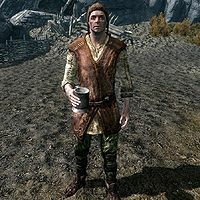 Jervar is a Nord warrior who lives at Whiterun Stables. He works for his father, Skulvar, who owns the stables. Jervar will direct you to his father if you wish to buy a horse from the stables. Jervar's day is pretty simple. He gets up at 8am, and then he goes outside and works on the stables for twelve hours. At 8pm, he then heads inside and relaxes for four hours. Then, at midnight, he heads to his bed and goes to sleep. He wears a set of farm clothes, including a pair of boots and a hat. He carries a key to Whiterun Stables as well as a selection of common loot and gold. He wields an iron dagger. When conversed with, he'll tell about who's in charge and his relationship with his father, saying, "Need a horse? Talk to my father, Skulvar. ", "Old lady Maiden-Loom owns the stables. But my father and me, we run things. ", "So I mostly sweep and shovel. You got a problem with that? ", and "Father says I ain't smart enough to be stablemaster. Some day." If his father dies, he'll take over the stables. If you talk to him, he'll say, "My father never thought I was smart enough to be a stablemaster. I just wish he was around to see me now." When exiting conversation, he'll say, "Uh huh." and "Back to work, I guess. There's never a shortage of dung to shovel around here." Skulvar: "You shoe that gelding, boy?" Jervar: "You know I did." Skulvar: "You clean out that muck?" Jervar: "Yes, father, I did. And I watered her, and got fresh feed, and refitted the old saddle, just like you asked. Is there anything else?" Skulvar: "Don't suppose there is. But you don't have to be so damned prickly." Skulvar: "I tell you? Saw that wild mare again yesterday, just outside the walls." Skulvar: "So? So? Shor's beard, boy! You forget where you're standing? What kind o' business we're running? We manage to break that mare and bring her back here, we can sell her for a small fortune." Jervar: "Oh. Okay. So we should try to... what? Capture it?" Skulvar: "Yes, son. We should try to capture it." Jervar: "Listen, father. I've been thinking...."
Skulvar: "Here it comes again. Not happy with a roof and a trade, no. You want to be something entirely... different." Jervar: "I'm just no good at this. You said it yourself. Gods, I don't even like horses. And if it's true what they're saying about dragons..."
Skulvar: "Dragons? You want to go out and fight dragons? Are you completely off your nut?" Jervar: "Come on, father, how hard can it be? They're just... big lizards. And those scales and teeth, they must be worth a fortune..."
Skulvar: "Big lizards? By Shor, your mother gave birth to a half-wit. That is the end of this discussion." Note: This NPC is one of many potential quest givers or quest targets for one or more of the radiant quests found on this page. If his father Skulvar dies, Jervar will sell you a horse in his place. This page was last modified on 20 May 2014, at 20:58.